Strange fast-spinning stars called magnetars get their namesfrom the fact that they are the universe's most powerful magnets and unleashmassive amounts of radiation. But now scientists have found that some magnetarscan release mighty explosions without needing giant magnetic fields as previouslythought. Magnetars are a kind of pulsingneutron star (or pulsar) ? a remnant of a star left over after a supernova,when a star's explosion crushed protons together with electrons into neutrons. Theyare a thousand times more magnetic than an ordinary neutron star and 10trillion times more so than a refrigerator magnet. Neutron stars are some of the densest objects known. Althoughthey are usually only about 12 miles (20 km) across, they are often 1.5 to 3times the mass of the sun. A piece of a neutronstar the size of a sugar cube can weigh about 100 million tons, or roughlyas much as a mountain. Now researchers have discovered a magnetic neutron star thatmay rewrite the book on magnetars? SGR 0418+5729, roughly 7,000 light-years from Earth. Astrophysicist Nanda Rea at the Institute of Space Sciencesin Barcelona, Spain, and her colleagues measured how fast SGR 0418+5729 wasspinning using data from four different X-ray space observatories. The more powerful the magnetic field of a neutron star is,the more it tends to slow down the speedof thestar's spin. As such, measuring this slowdown allows researchers toestimate the intensity of the neutron stars' surface magnetic fields. Typical magnetars have magnetic fields measuring up to amillion billion gauss in strength ? strong enough to rip atoms apart. Only 16or so magnetars are known to date. This suggests a lot of regular neutron stars "mightstart behaving as magnetars at anytime, regardless of their low magneticfields," Rea told SPACE.com. Magnetars are believed to include stars known as soft gammarepeaters (like SGR 0418+5729) and anomalous X-ray pulsars, which are known forexplosions of gamma rays and X-rays that can last from days to years.Scientists had thought the magnetars' powerful magnetic fields were the drivingforce behind these extraordinary bursts. The researchers suggest the source of their magnetar's powermight be hidden deep within its surface. Although its surface magnetic fieldmight not be as strong as typically seen in magnetars, it could still have ahuge internal magnetic field. "It is the very first time this has been observed and the discoveryposes the question of where the powering mechanism is in this case," studyco-author Silvia Zane, of the University College London, said in a statement. "At this point, we are also interested in how many of the other normal,low field neutron stars that populate the galaxy can at some point wake up andmanifest themselves as a flaring source." SGR 0418+5729 is 24 million years old, making it quite olderthan other soft gamma repeaters and anomalous X-ray pulsars. 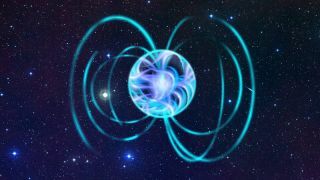 "We might be seeing an old population of magnetar whichare dissipating in bursts its last bit of its internal magnetic energy,"Rea said. The research is detailed in the Oct. 15 issue of the journalScience.